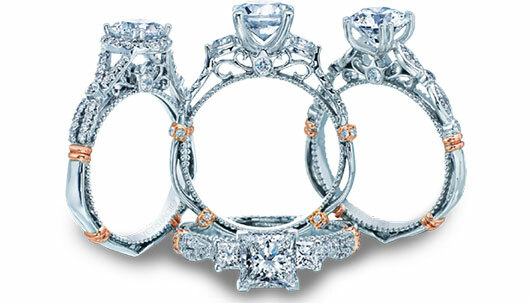 Affordable beauty and elegance are yours with bridal jewelry from Verragio’s Parisian collection! Petite pieces flourish with fine features that include French beaded inlay, lace detail at the Verragio crest and four wraps on the shank. Make your engagement ring personal, with custom components inside and out the stunning semi-mount; custom components include halo, scrolls, shank and beading, available in white, rose and yellow gold finishes. Let your imagination run wild to create the Verragio ring of your dreams.